The origin of the term “Dutch Oven” is in question. Some say that the name comes from pots that the Dutch who settled in Pennsylvania used. Others think that the term comes from the Dutch process of casting iron pots in sand molds. Regardless of the origin, the original Dutch ovens were characterized by having legs to hold them over the coals of a fire and by having a flat lid onto which more hot coals could be piled. While this style of Dutch oven is still in use today for “chuck wagon cook-offs,” a more modern form is characterized by a flat bottom and a tight-fitting lid that can be either domed or flat. Since Dutch ovens are primarily designed for stewing and braising (although you can bake cakes and biscuits in them, too), the best material for a Dutch oven is cast iron. Cast iron retains heat and releases it evenly into the food. There are two basic types of cast iron Dutch ovens available on the market. For those of you who are trying to decide between cast iron and enameled cast iron, the main thing to consider is cast iron’s reaction with acidic ingredients. Once the cast iron is well seasoned, this should not be a problem, but you will not want to cook anything with tomatoes, wine or other acidic ingredients in a cast iron Dutch oven until it is thoroughly seasoned. Otherwise, the main concern is price. The cost of enameled cast iron can be prohibitive, and price is certainly a prime consideration. Dutch ovens are made of other materials, too, including anodized aluminum and stainless steel-clad models. If you have one of these, by all means use it. If you don’t have a Dutch oven, I would consider the heavier, cast iron models first. When considering a good pot for moist heat cooking methods, such as braising and stewing, it is not necessary to purchase a pan that heats quickly, since the cooking process will take a long time. Rather, the most important quality is that the pot be heavy, hold heat and distribute it evenly. This reduces the likelihood of “hot spots,” and will help keep the food on the bottom of the pan from burning during hours on the stove or in the oven. 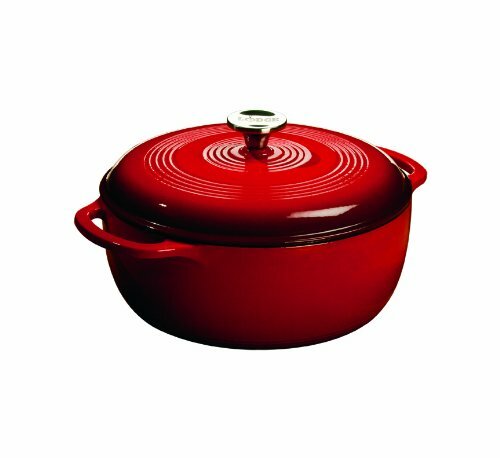 If you do own a Dutch oven that is made of something other than cast iron, make sure that the handles are sturdy, are firmly attached to the pot or lid and that they are oven safe. If they are flimsy and/or made of plastic, they could pose a safety hazard and you would be well-advised to buy a different pot. If you are a small person or have weak wrists, err on the side of caution and purchase a lighter-weight aluminum or stainless-steel Dutch oven. Cast iron models are very heavy, even when not full of boiling hot food! Made of heavy cast iron. Tight-fitting, recessed flat lid for piling on coals. This design allowed for fairly even heat to radiate into the food from all sides. A Dutch oven is certainly a precursor of the modern oven and was used to cook everything from chili to cobblers to cornbread. Tight-fitting domed or rounded lid. The modern Dutch oven is designed to be used both on the stove top and in a modern oven. They are most frequently used for moist heat cooking methods such as stews and braises. The tight fitting lid inhibits evaporation, keeping food moist as it cooks. Modern camp oven cooks often use charcoal briquettes when cooking in their footed camp ovens. Using briquettes helps to ensure even heating. There is even a formula for picking the right number of briquettes to use, depending on the diameter of your camp oven. For heat from the bottom, the rule is diameter in inches minus three. For heat on the top, it’s diameter in inches plus three. For example, if your camp Dutch oven is 10” in diameter, you would use 7 briquettes under it and 13 on top. Although they can be used for baking, most people will use their Dutch Oven for moist heat cooking, such as braising and stewing. These methods start with searing the meat on the stove top and then simmering the seared meat for a long time at a relatively low temperature in a flavorful liquid, often stock and/or wine. While the term “braising” sounds somewhat intimidating, it is a fairly straightforward cooking process, the kind you can walk away from for an hour or two or even three and have the food still turn out well. Dredge the meat or pieces of meat in seasoned flour (optional) and sear until deep golden brown on all sides. Place the meat in your Dutch oven, along with some roughly chopped onion, carrot and celery. You may add herbs if you would like. Bring to a boil on the stove, and then turn down the heat to maintain a gentle simmer. Cover the pot and put in a 250-275F oven or leave on the stove on low heat until the meat is very tender and shreds easily with a fork. Depending on the meat, this could take anywhere from about 45 minutes for chicken to 2 ½-3 hours for tough cuts of meat. There seems to be some confusion about braising on the stove top versus in the oven. When braising on the stove, the heat is direct, and it all comes from the bottom. In the oven, the heat is indirect (the pot is not in contact with the heating element) and radiates from all directions. Since braising and stewing are relatively long cooking processes, a heavy Dutch oven will still radiate heat from all sides, even on the stove. If you have a stove that can maintain a very consistent low temperature, such as a gas stove, you can should be able to braise or stew on the stove with no problem. If your stove runs hot or is difficult to keep at a very low temperature, you could run the risk of burning the food on the bottom of the pot, so it is best to braise in the oven. At the end of the day, this is a personal choice. For myself, I give the edge to the more gentle, indirect heat of the oven over braising over direct heat, although I have done both with good results. If you have a crock pot, you might not need to purchase a Dutch oven. Crock pots excel at stewing and braising—that is what they are made for. One point to consider: you cannot sear in the pottery inserts of a crock pot. If you want to sear your food before braising or stewing, you will need to use a separate pot. Other than that consideration, there is no other reason that I can think of that a Dutch oven would be better than a crock pot, or vice versa. As long as you keep the heat low, both will yield a moist, tender and richly flavored end product. Some “food snobs” might turn up their noses at a meal prepared in a crock pot, but I bet that in a blind tasting, they would not be able to tell the difference between a Dutch oven meal and a crock pot meal. Fun Fact: In 1997, the Dutch oven was named the official state cooking pot of Utah! When I think about buying a dutch oven, I will look at the benefits and then disadvantages. I got mine from MEC pure clay cookware and the benefits of cooking with it are: its 100% natural clay, its non -toxic, un-glazed, no chemicals or metals used. It can be used on the stove top and in the oven. Great info! There is some additional info on How to Select the Perfect Dutch Oven at our website. Love you passion for cooking. If I had only one pot (if pigs could fly) in my kitchen, it would be my 7 qt Le Creuset Dutch oven. I use it at least twice a week, more in winter, and do everything from soups and stews to steaming artichokes to my 8 hr Bolognese sauce in it. Unlike a crock pot you can render the bacon, then sear the pot roast, then sweat the mirepoix, then put everything back in and put it in the oven: dinner for six using one pot, one knife, and one cutting board, and the beef tastes braised rather than steamed. Yes, it’s expensive, but not on a per-use basis, it’s versatile, and cleanup is easy. I have a Dutch Oven with a glass lid, which I’ve always used on the stove top. Might the lid crack if I use it in the oven for several hours? If your Dutch Oven is made for the oven, I can’t see why it would crack, but I think this is a better question for you to ask the manufacturer or the store where you purchased it Kimi.